Myrrh has been used for centuries as an ingredient in incense, perfumes, and for embalming and fumigations in Ancient Egypt. In folk tradition it was used for muscular pains and in rheumatic plasters. In China mo yao has been used since at least 600B.C. 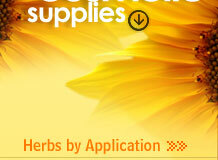 Primarily as a wound herb and blood stimulant. Myrrh oil, distilled from the resin, has been used since ancient Greek times to heal wounds. 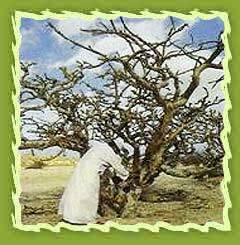 A small tree which is the source of myrrh. The gum resin exudate from wounds in the stem is pale yellow at first and later solidifies ti black-brown. Oil is slightly viscous, yellowish to amber orange with a warm-spicy, balsamic fragrance. Overly viscous, dark brown oils may be extracted resinoids and not steam distilled essential oils, which are more useful in aromatherapy applications. Myrrh resinoids are more appropriate as perfume fixatives. Chemical constituents: Myrrh oil has various chemical compounds that include Heerabolene, limonene, dipentene, pinene, eugenol, cinnamaldehyde, cuminaldehyde and cadinene.. Extraction: : It is extracted by the solvent extraction of resinoid from crude myrrh while oil is obtained by steam distillation. Simplers Myrrh is CO2 processed, a method that uses carbon dioxide in a supercritical state in order to extract essential oil quickly through low heat and high pressure. Because CO2 is a gas, it is completely removed when the pressure is released, resulting in a premium extract that contains no solvent residues. This method is one of the most advanced extraction processes in the world and produces extracts high in physiological activity with fragrances that come very close to the aroma of the plant, often more accurately than with steam distillation. It has therapeutic properties which includes anticatarrhal, anti-inflammatory, antimicrobial, antiphlogistic, astringent, balsamic, expectorant, antiseptic, fungicidal, revitalizing, sedative, stimulant-digestive and pulmonary tonic, tonic-uterine(emmenagogue) hormone-like (thyroid modulator) and aphrodisiac. One of the most appropriate ways to use myrrh may be to burn the crude resin on hot coals as the ancients did. This simple ritual will release a distinctive aroma and sinuous trails of fragrant incense that hold a mysterious presence in the room. The curling tendrils of burning frankincense and myrrh have measured the passage of history, and facilitate the navigation of inner and outer spiritual. For rejuvenation & meditation - myrrh is used after a stressful event or an extended illness, to revitalizes both body and mind. For spirituality - inhale the fragrance of myrrh essential oil or the crushed resin to awaken your awareness of the spiritual reality behind our everyday existence. This is an excellent tool to use prior to or during religious rituals. The resultant expanded awareness also helps calm fears and halt questions concerning the future. Myrrh - Deep meditation, mystical, sacred. Promotes inner strength, confidence and courage. Myrrh oil is effective against excessive mucus in the lungs and helps to clear ailments such as cold, catarrh, coughs, sore throats and bronchitis. It is used for diarrhoea, dyspepsia, flatulence and hemorrhoids (haemorrhoids). It is very good for mouth and gum disorders such as mouth ulcers, pyorrhea, gingivitis, spongy gums and sore throats. On the skin, it is used with great success on boils, skin ulcers, bedsores, chapped and cracked skin, ringworm, weeping wounds, eczema and athlete's foot. It is of great help to promote menstruation and for relieving painful periods and to ease difficult labor in childbirth. Myrrh is commonly used in Chinese medicine for rheumatism, arthritis and circulatory problems. A direct emmenagogue, a tonic in dyspepsia, an expectorant in the absence of feverish symptoms, a stimulant to the mucous tissues, a stomach carminative, exciting appetite and the flow of gastric juice and an astringent wash.
Myrrh essential oil has been useful for amenorrhea, dysmenorrhea, menopause, uterine tumors, as it purges stagnant blood out of the uterus. Good for obesity and diabetes. It is used in chronic catarrh, phthisis pulmonalis, chlorosis, and in amenorrhoea is often combined with aloes and iron. As a wash it is good for spongy gums, ulcerated throat and aphthous stomatitis and the tincture is also applied to foul and indolent ulcers. It has been found helpful in bronchorrhoea and leucorrhoea. The oil, resinoid and tincture are used in pharmaceutical products including mouthwashes, gargles and toothpaste; also used in dentistry. The oil and resinoid are used as fixatives and fragrance components in soaps, detergents, cosmetics and perfumes, especially oriental types and heavy floral. Myrrh Pure Therapeutic Grade Essential oils is used in soap making ingredients, lotions, massage oils, diffusers, potpourri, scent, air fresheners, body fragrance, perfume oils, aromatherapy products, bath oils, towel scenting, spa's, incense, light rings, laundry, facial steams, hair treatments and more. Myrrh has been used for centuries as an ingredient in incense, perfumes and for embalming and fumigations in Ancient Egypt and other Western countries. For a disinfectant - combine 3 drops of myrrh, in an aromatherapy lamp to reduce the risk of spreading an infection and combating germs in sickrooms. Myrrh has one of the highest levels of sesquiterpenes, a class of compounds that has direct effects on the hypothalamus, pituitary and amygdala, the seat of our emotions. Myrrh is widely used today in oral hygiene products. Myrrh has been used as a oldest known perfumery material. Burning incense on charcoal is truly a unique and up-lifting experience. Each resin opens an avenue of peace and contentment. Mystical myrrh resins, fills natural fragrances, warm the heart, calm the mind, attunes one in spirit. Myrrh is used in perfumery, mouth washes, massage, diffuser, denifrices and in religious ceremonies as incense. Because of its ability to preserve, the fresh myrrh oil was used as a cosmetic ingredient. It is reputed to reduce wrinkles and preserve a youthful complexion. Egyptian women used myrrh in their facial preparations. It has a slightly cooling effect on the skin, and so would be especially useful in a hot dry climate. It has been used since ancient times to prevent ageing and rejuvenate body and mind, it is very specific for skin diseases. Gum is stimulating, draining, purifying, toning and moderately warming.